Set / Violoncello 4/4 a + d (PASSIONE) steel/chrome steel G + C (CHROMCOR) steel/chrome steel Warm and round sound, with a clear powerful tone Excellent bow response Student Cello Set - Combination of steel strings specially attuned to the requirements of students and their instruments. All four strings have a solid steel core made from a high-tensile steel and are wound with chrome steel. Outstanding value for money. Excellent bow response on all strings thanks to a solid steel core, especially on the G- and C-strings. Easy left hand response with little finger pressure necessary! No metallic sharpness with A- and D-strings. Warm and round sound with a clear powerful tone. 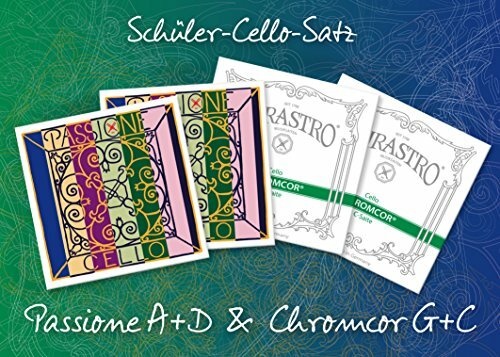 While working with some of the best violin makers Pirastro has come up with a cello set that is an excellent choice for students: Cello Passione A and D medium combined with Cello Chromcor G and C.